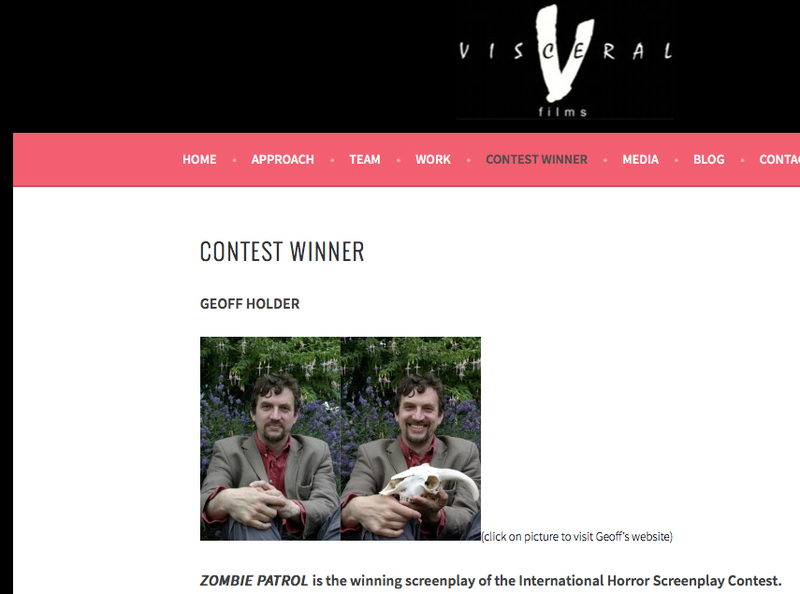 My script ZOMBIE PATROL won the International Horror Screenplay Competition run by Visceral Films – and the movie is scheduled for production later in 2016, with the principal location being the Land of Illusion Horror Theme Park in Ohio. I’m rather chuffed about this. “Geoff Holder’s story works in so many different ways- it’s a character-driven horror rompfest complete with humor and a great story arc. It highlights the Land of Illusion theme park and the mission of the contest perfectly. The competition was intense- Geoff’s work was selected from within a field of other writers spanning the globe from the US to the Middle East, Africa, and Europe. As winner of the contest, Mr. Holder will have Zombie Patrol produced, be credited as its writer, and be paid commensurate with an independent $2m feature length project. Additionally, he will have a first look deal with Visceral Films. I’ll be posting regular updates as the amazing production team take the movie through pre-production into the filming phase. This entry was posted in Movies and scripts, zombies and tagged film production, Geoff Holder Writer, horror movies, Land of Illusion Horror Theme Park, movies in development, Ohio, Screenplay Competition Winner, screenwriting, scriptwriting, Visceral Films, ZOMBIE PATROL, zombies on 24/02/2016 by Geoff Holder. Commissioned and Experienced Screenwriter, offering Specs and Work-for-Hire. • Specialties: supernatural, horror, sci-fi, fantasy, action thrillers. • I like to turn traditional monsters (vampires, dragons, demons and their ilk) into the good guys. Or at least, the not-quite-so-bad guys. • Alumnus of the ScreenwritingU Pro Series. • Hugely experienced Author. • 36 non-fiction books published, covering the paranormal, the mysterious, the murderous, and some very weird and bloody history.